Education has transformed a lot it is gaining digital form nowadays. iPads and stylus became the note and pen for the current generations. College students are using MacBook as their notebooks. The internet has reduced the distance between the students and the educational institutions. Students from all over the world can get their lessons on their palm now. Being in such a fast paced world, educational institutions and schools must match their speed. Right from students admission to exam results can be done on the websites now. It is a must to have a modern website for the educational institution. WordPress education themes give you the advanced option of having a learning management system on your website. Some of you may not need such advanced features for your site. If you need a site only to showcase your infrastructure, your courses and to get inquiries HTML school website templates will do the job for you. HTML website templates have their own pros and cons. Of course, they cannot provide you with as many features as the WordPress themes give you. But it doesn’t mean you shouldn’t use an HTML website templates. Once you installed the HTML school website templates with the contents you want, that’s it you are all set to go. You no need to think about template updates and other security updates for the HTML templates. 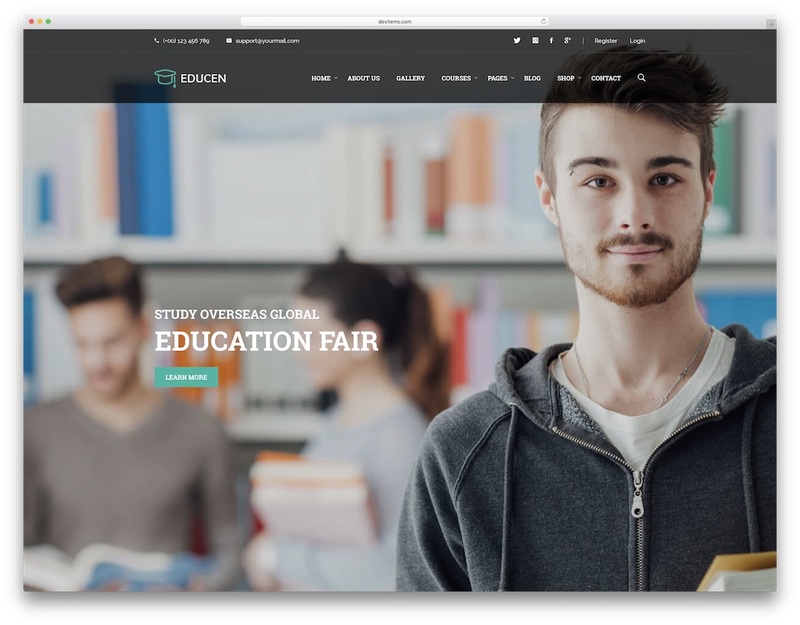 If you are going to maintain a passive site in which you are not going to update contents a lot you can choose one of these best school website templates. 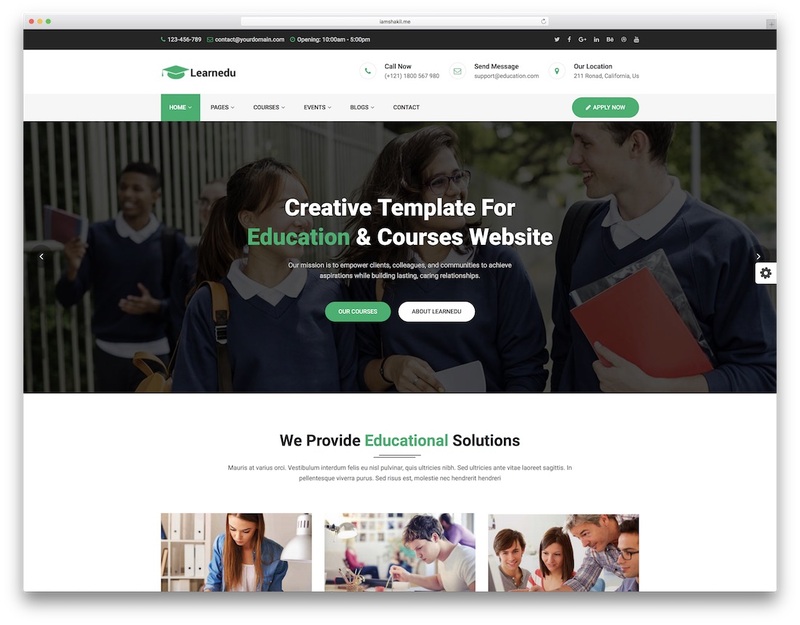 Learnedu is a modern and sophisticated school website template with numerous fantastic features and even better characteristics. In the box, you will find two different homes. The default one is keeping things more on the static side while the animated version is, well, you get the gist of it. If you are looking for a tool to bring your school and your courses on the internet, Learnedu can be one of the finest options for you. The template is entirely responsive, based on Bootstrap 4 and compatible with all web browsers. In other words, all websites powered by Learnedu will work smoothly no matter where your visitors and potential students come from. Enjoy the fantastic scrolling animations, hover effects, powerful slider and sticky navigation. Whatever you wish an educational website would and should have, Learnedu delivers it. 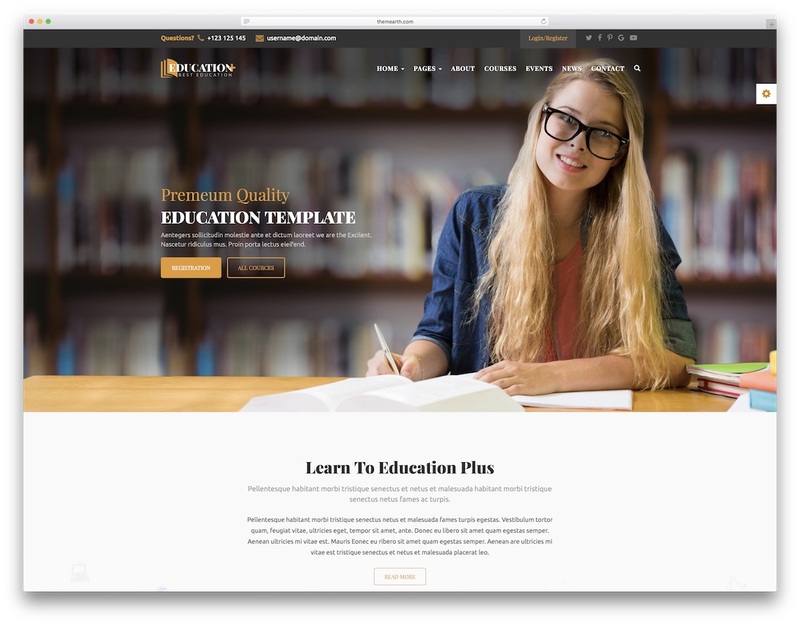 No matter what you are teaching, you are going to need a solid school website template to help you build your website. Edulearn Education comes with five amazing home pages to choose from and an addition of four header variations to share the information your students need. All this calls for a quick start of your enticing web space that will attract more and more visitors and help them gain the knowledge they are seeking. Edulearn Education is fully responsive across all platforms and looks great regardless of the device that they use to visit your site. Keep everyone up to date with the included courses pages and provide your teachers with a space of their own to talk about their fantastic classes. The blog and all other inner pages are perfect to let your students know what is coming up on the campus. JuniorHome is for all the juniors out there or should I say, their parents. 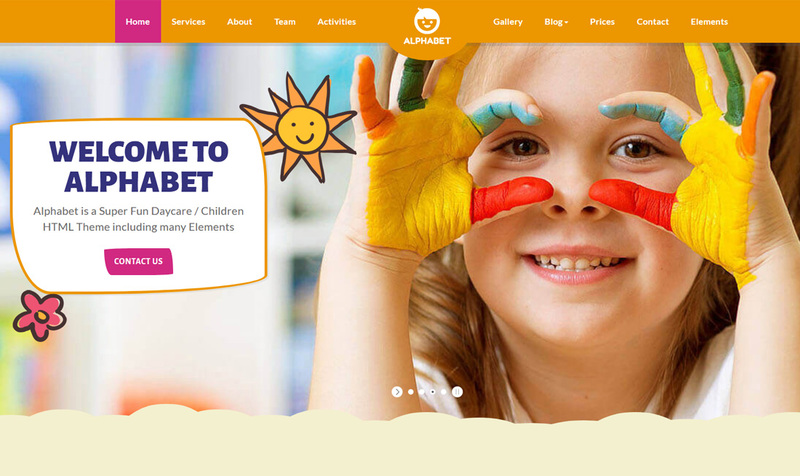 It is a daycare and kindergarten school website template based on the well-liked Bootstrap Framework. It provides the flexibility and fluidity your website needs to smoothly and instantly adapt to all mobile devices. In this day and age, every page should be mobile-ready – it is a must! In the JuniorHome bundle, you will discover five index pages, each with a unique and clean design. 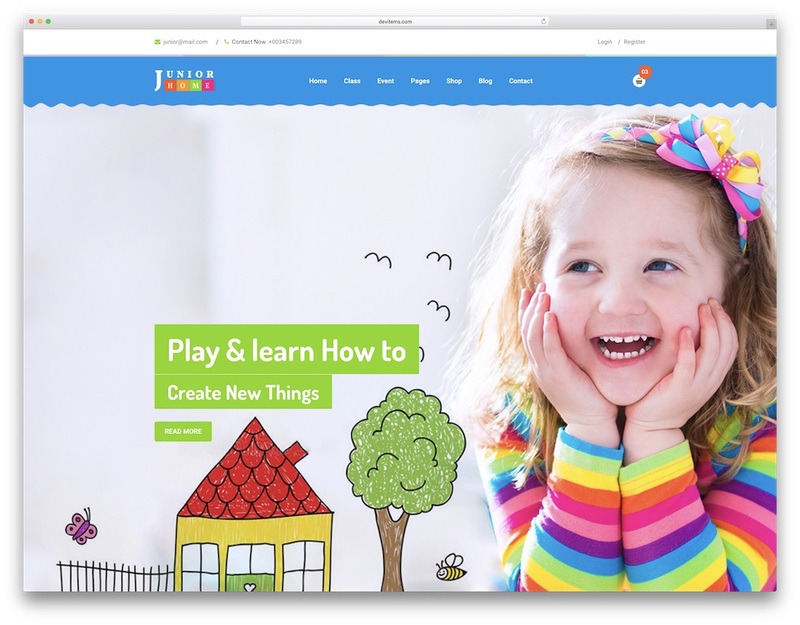 While you can use JuniorHome solely for your kindergarten’s online presence, you can also use it to forge an online store. Or maybe you would want to mix the two together into one grand web space. Besides, you can also start a blog and use it to share additional information, tips and all the rest that parents could find of benefit. 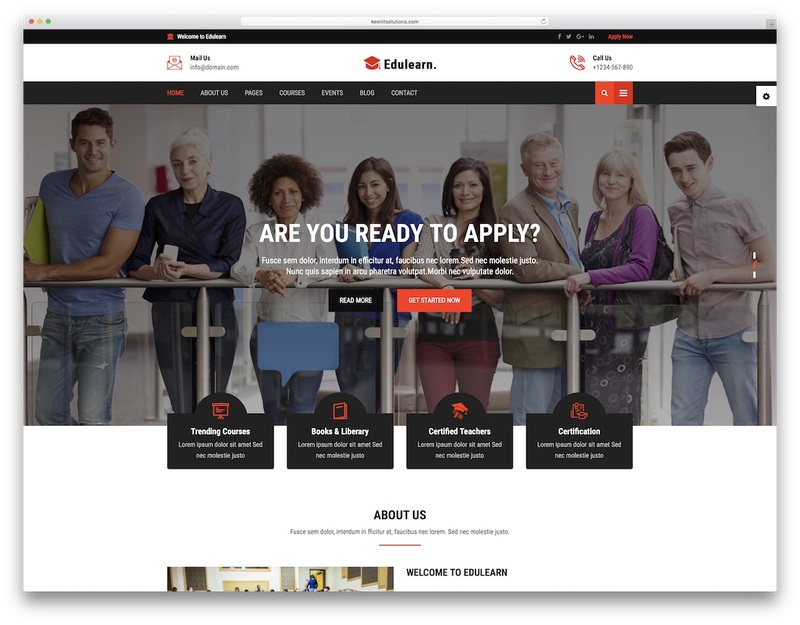 When you need a page to keep your students fresh, the Edulab school website template has everything you need. The minimal, neat and contemporary user interface gives your users a clean experience and brings them to the right information that they need. Edulab is built with Bootstrap grid system for a stable, elegant and responsive end product. The tool makes sure it works seamlessly across all devices, from handheld gadgets to desktops. It is incredibly easy to apply your own branding and coloring to Edulab and make it stand out on the web. Not only that, Edulab allows you to individualize the web design however you fancy. Edulab is also fully supported and will never let you down when you need it to work. Go with one of two homes and utilize all other ready-to-use inner pages and have the final work done in a breeze. Download Edulab today and see the difference. Contribute to the world by spreading your valuable knowledge with Memozin. 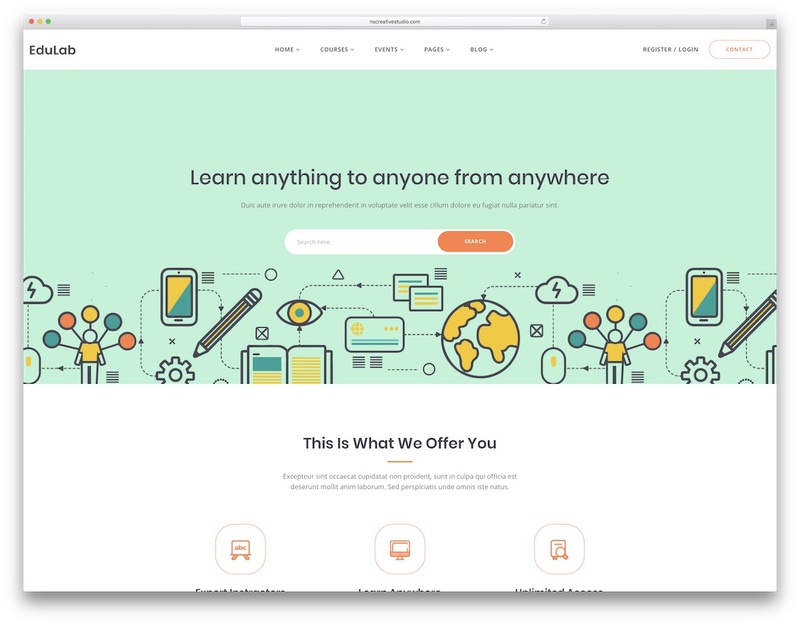 This school website template lets you jumpstart with your teaching career easily and freely. Schools, universities, teachers, online courses, you name it, Memozin handles it all without hassle. Showcase your all-in-one website confidently as the visuals are very responsive, which means your page will look functional on any device. 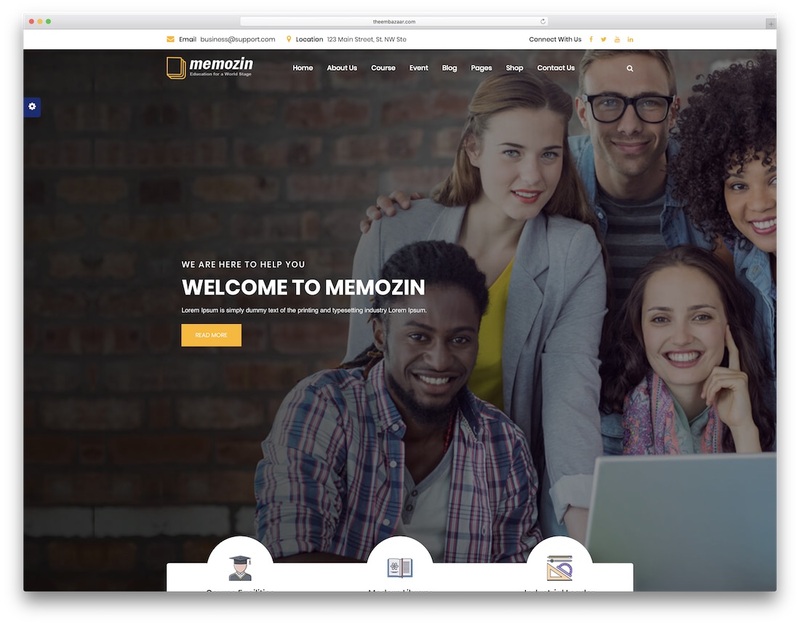 With Memozin, you can save yourself a ton of time and effort when it comes to designing the ideal website for your upcoming project. You can freely use the tool out of the box and have the look ready almost instantly. But do enhance it with your branding and creativity and make Memozin offer students an experience like none out there. Simply download Memozin now and start playing around with its vast collection of features and components. Your imagination can do so many wonders with Kingster. Highly sought after by educators, headmasters, trainers and other experts, this school website template is definitely second to none. While it has a massive collection of ready-made material to guide you, you can still enrich it with your own artistic approach. However, Kingster comes with a stunning array of fifty HTML pages and two home designs to get you started. You are free to use any style for different pages to let out your individuality. This opens a wide scope of opportunities to those who dream of exercising their creative freedom while portraying a respectable brand image. All Kingster’s designs fit well with any mobile device due to its responsiveness. You deserve a professional and sophisticated educational website that will skyrocket your business after all. Get your website working efficiently with Edubin. This school website template caters to all pros who wish to showcase all things related to learning and teaching. 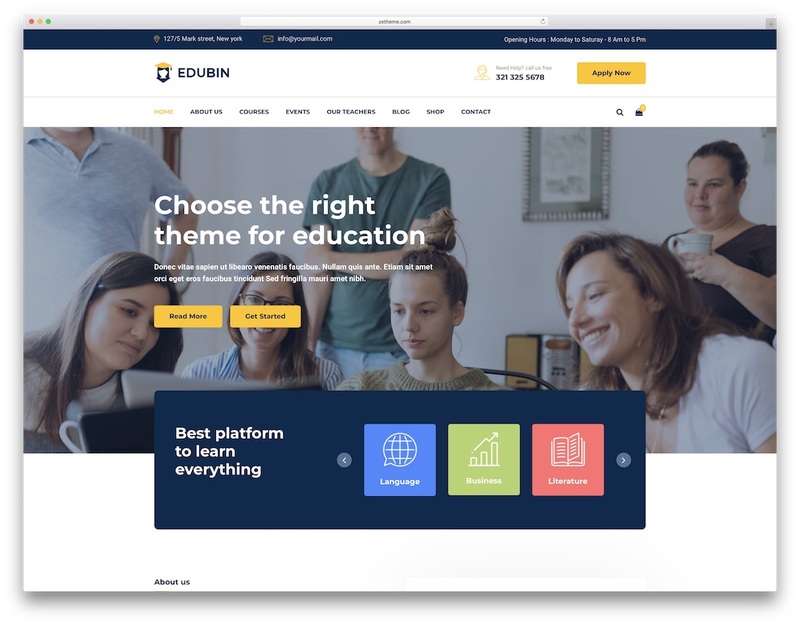 Edubin is undoubtedly one of the best templates you can currently find on the market for many reasons. To start with, you should know that Edubin is based on Bootstrap Framework what gives it the necessary flexibility. You can gain access to its multiple page layouts that go along with color schemes and background elements. After choosing your ideal home page (there are three), you can kick off your website establishment process without the need to kick it off from the ground zero. You can add and manage custom content, online courses, links and even start writing a blog if you prefer. The options are there thanks to the powerful and convenient Edubin. Make your website shine with Cultura and its outstanding, clean and modern web design. It is all there, you only need to put it to use and get your school to reach a much wider audience. Cultura comes loaded with two different and unique index pages which you can use as is or improve them per your needs. Cultura also features an about us page to let everyone see what you have to offer and why you are the best in the game. Cultura actually has a total of 22 HTML files for you to take to your advantage. Get your students familiar with your offerings using both the courses and the courses details page and help them reach their full potential. 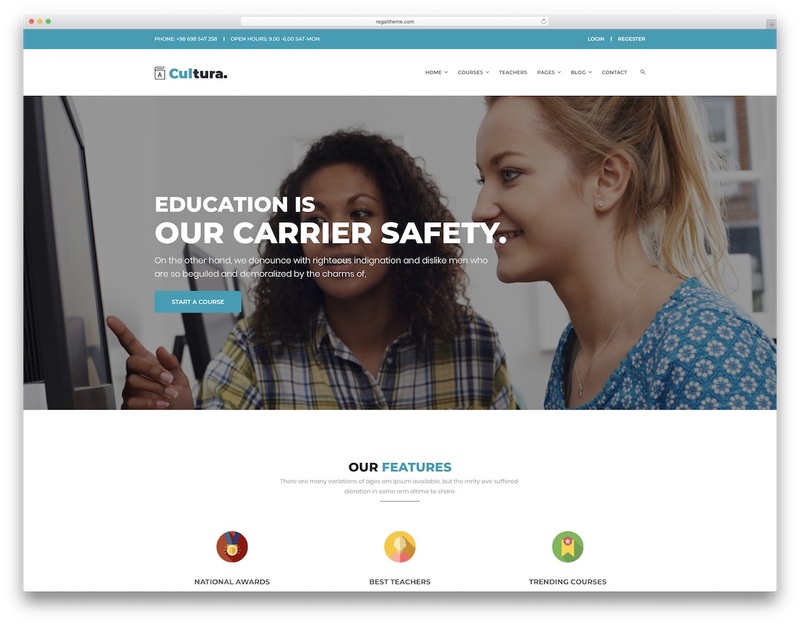 If you need a site that illustrates everything that you can do for your students, look no further and give Cultura a shot. 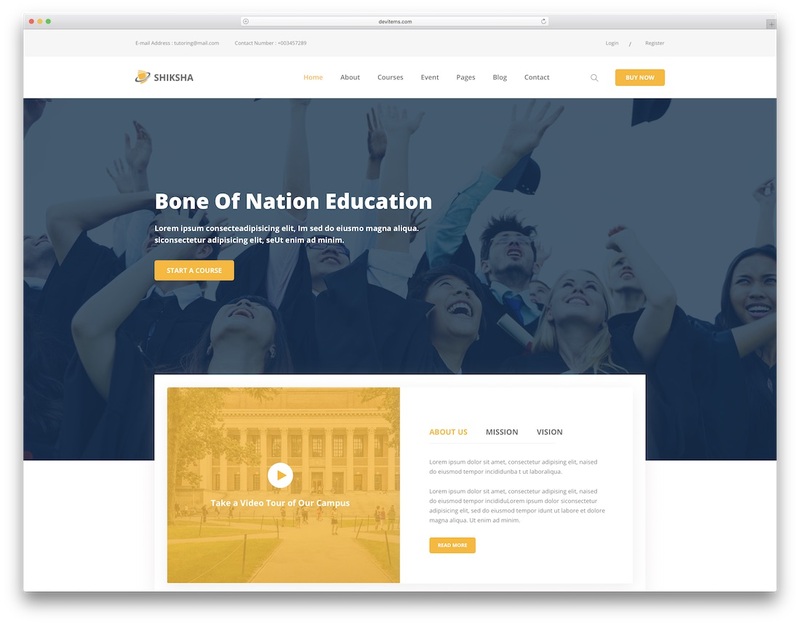 Education Master is a fantastic school website template for all types of educations, universities and colleges. Whatever there is you would like to bring online, do it with Education Master and forget about the rest. It is an all-in-one package of goodies to hammer out the exact website for your school that you always wanted. You will enjoy building the platform while students will take pleasure in browsing your page and selecting the right courses for them. From student profile and courses booking to exam timetable and login and register forms, Education Master has it all. But this is just a small percentage of what you get with this solid website canvas. Education Master is also 100% mobile-ready, search engine optimized and comes integrated with social media. Besides, it practices all the modern web technologies to keep your page steady and secure. Just as much as it is important to have a cutting-edge front-end so is important to have a handy back-end to run an online platform successfully. 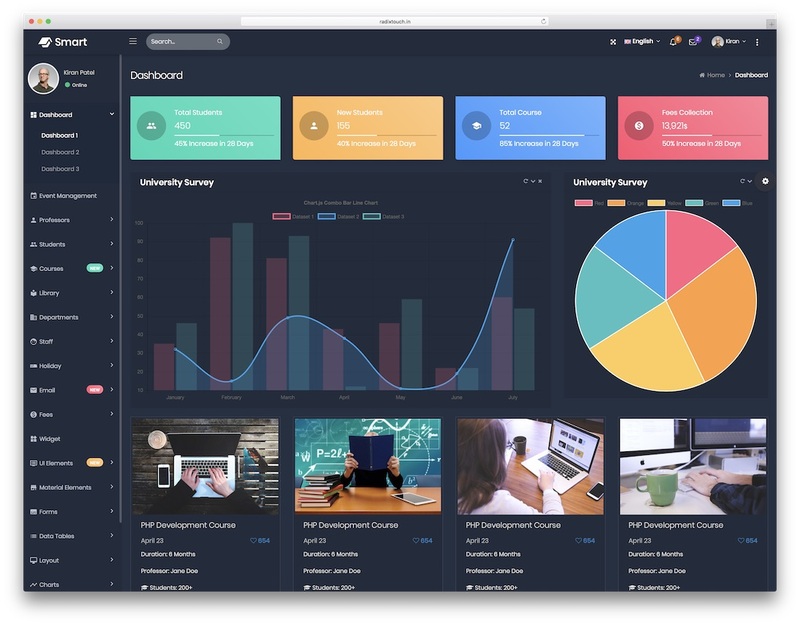 Smart is an admin dashboard template exclusively created for schools, universities and colleges. There are eight different layouts at your service, from dark and light to wide and boxed and then some. Pick what you dig and start editing it with your details. Smart uses Bootstrap and Material Design what makes the layout flexible and appealing to the eye. It also rocks just about any and all the pages you need for a complete admin dashboard. This means you get predefined pages for professors, students, courses, library, you name it, it is all there. Smart also sports killer UI elements and loads of practical widgets. If the dashboard is what you need for your school, Smart is the right option for you. A fully customizable website is at your fingertips with Education Plus school website template. This powerful and gorgeous offering comes packed with the assets you need to run your courses online. There is a total of eight home pages and a full thirteen inner pages to cover the complete creation of your page. They are ready for you to fill them with whatever you deem necessary. Education Plus is responsive and cross-browser compatible. Your students will always have a smooth and comfortable experience they need to excel. Some other cool features of Education Plus are typing and parallax effects, working contact form, smooth scrolling and Instagram feed. With Education Plus, you also get a lifetime of free upgrades and professional support. It has everything you need to grow into the future. Shiksha is an HTML5 school website with a grand web design that entices everyone that ever visits it. Your page will become a web destination where new and returning students will enjoy hanging out. Create a remarkable experience for each and every single one of them and bring your school, university or college to a completely other level. What’s best, you do not have to put countless hours of work into it to bring it to realization. Shiksha has the stuff ready and set for you to use it right off the bat. Two homes, about, courses, event and blog pages await every Shiksha user. It also has a login and a register page, a full-width slider and a widget-packed footer section with newsletter subscription box. Shiksha also includes a back to top button, social media icons and supports video presentations. On top of that, you, too, get comprehensive documentation that will help you make the page you are after. 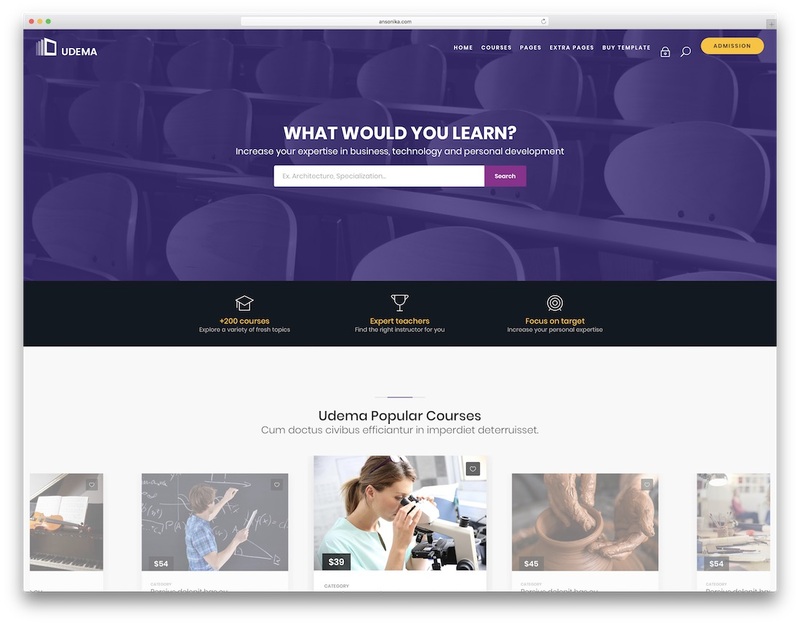 For a slightly different look and a powerful website that offers every feature that you need, look no further than UDEMA. The school website template is equipped with five spectacular homes that kick-start the process of creating the much-needed website. Furthermore, it also has two different menu styles to create the look and feel that you are in need of. Besides, UDEMA is also fully modifiable for you to tailor it to your requirements to the T.
You can make sure your students are safe with the included password strength checker for new accounts. The courses pages and courses details along with the cart section will let them get everything that they need with just a few clicks. They can get back to learning in a snap. To offer your students everything they want and then some, all you need is UDEMA template. 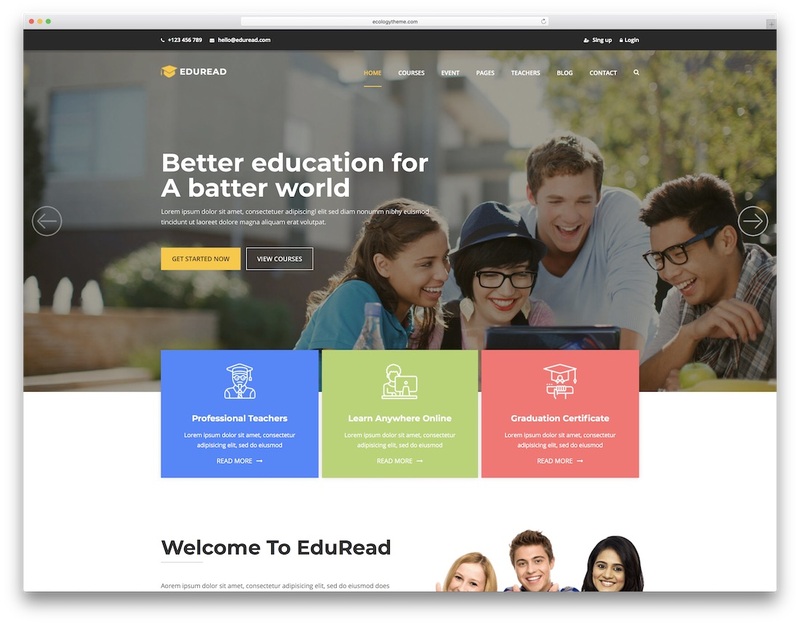 Provide your school with all the extra exposure it deserves with a dedicated website template, EduRead. It is a neat, trendy, professional and cool tool for a quick page solution. With a total of 25 HTML pages and four fantastic homes, you have all the necessary for a website like none out there. While you can use EduRead out of the box, it is advisable to tweak it at least slightly and make it your own. The assets of EduRead are many so there is no way we can go through all of them here. After all, this is not an in-depth review of the template. This is just to hype you up and get you further investigate this grand school website template and possibly create a page using it. If you are ready to proceed, just take action and let EduRead get things sorted out for you, your school, your courses and your students. 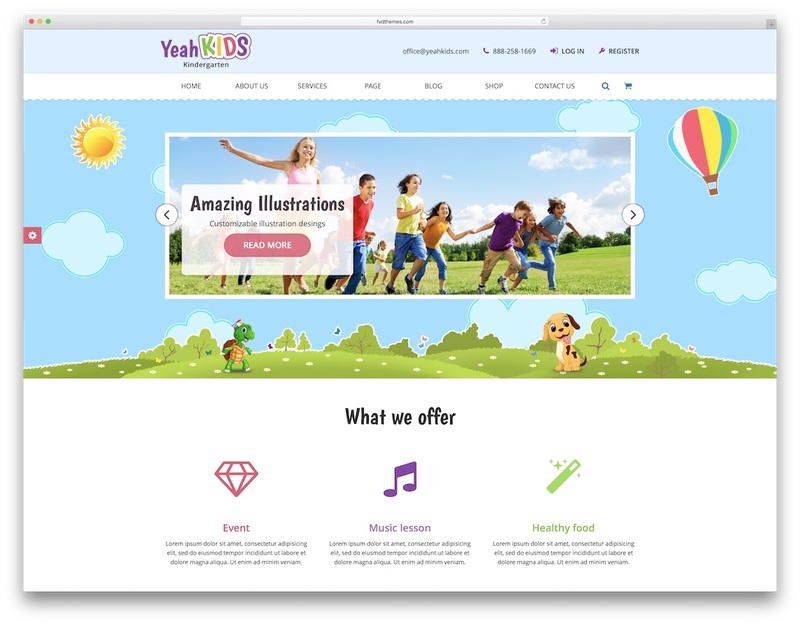 For any kindergarten, daycare or preschool in need of a functional and valuable website, the Yeah Kids school website template is here to deliver. The site skin has superb illustrations that are designed to appeal to a wide audience. 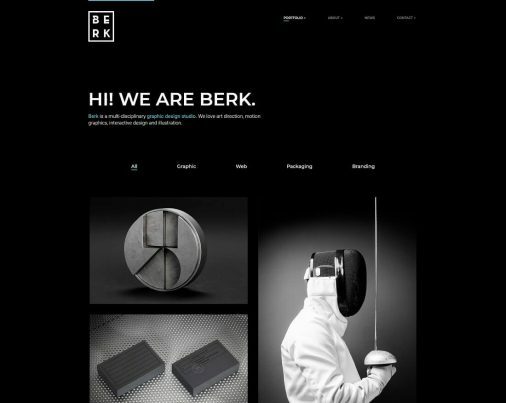 And you can customize the overall web design using them for creating something truly remarkable. Yeah Kids is built with quality code and is packed with easy to read documentation so you are never left out in the dark. Yeah Kids will not let any of your users down, no matter which device and browser they use for surfing the web. It is responsive and will look just as great on a smartphone as it will on a desktop. On top of all the mentioned and many other practical traits, Yeah Kids also comes with a blog and a portfolio section. Use the two to keep parents up to date with everything going on over at your end. 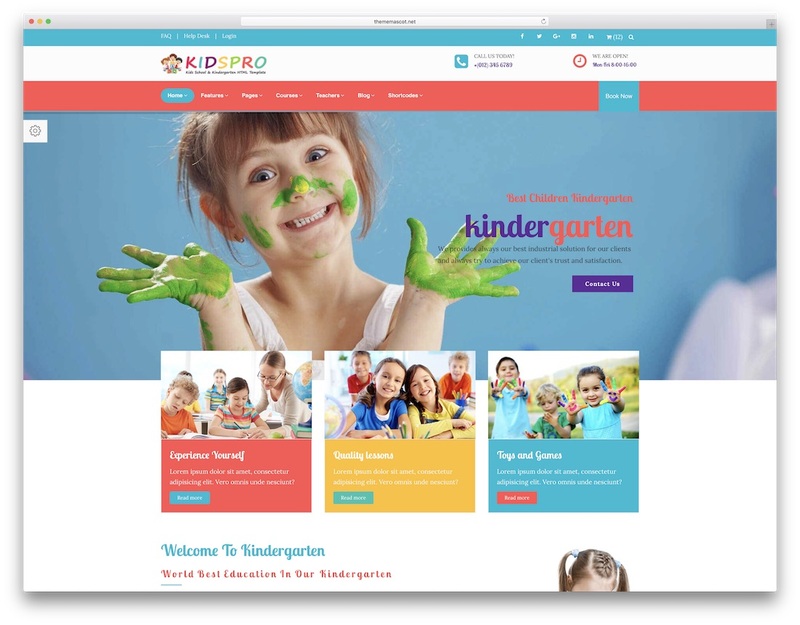 For a website that you can customize almost in its entirety and the one that comes with loads of predefined elements, you need Kids Pro school website template. You will not need to spend countless hours on the design in order to create a site that looks appealing to the eye and performs greatly. 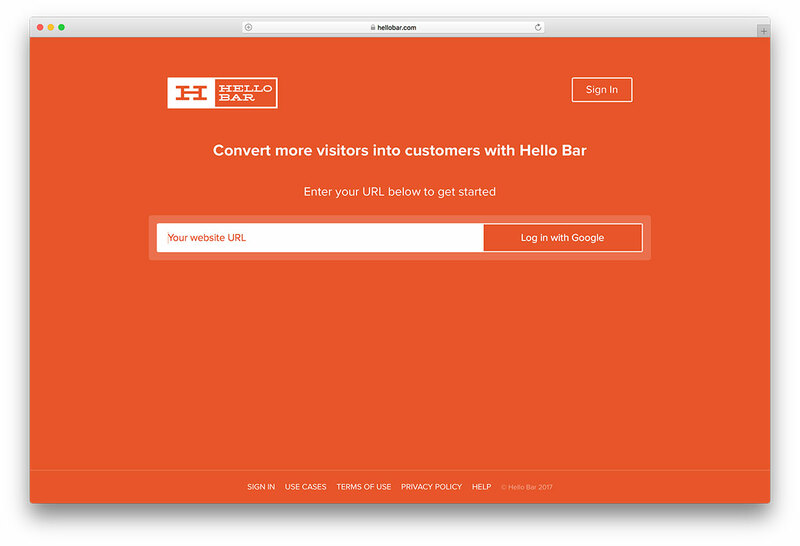 You have a ton of home page demos at your disposal, as well as full-width, boxed, dark and hot layouts. With your added creativity, the options you have with Kids Pro are close to endless. With the included premium extensions (no extra fees), icon sets and Google fonts, you can customize and personify your site until it is perfect for the feel you want to convey. Indeed, you can change the colors and incorporate parallax effect, too. Just like with any other websites for school, Kids Pro also shows you how easy web design can be. 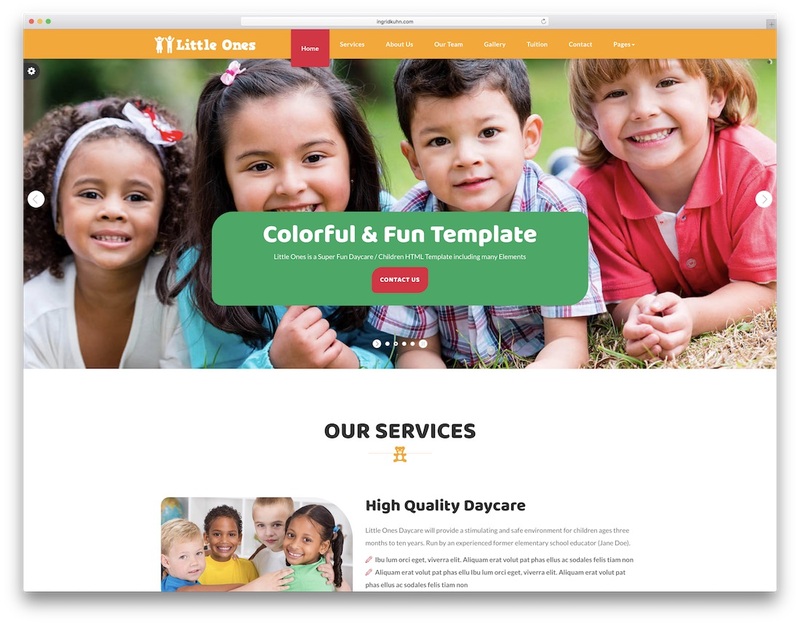 Little Ones is a cute name for a school website template. But cuteness is not only applied to the name but to the web design, too. Little Ones makes sure you are stacked with all the needed material for a neat and, well, cute outcome. Every parent that will ever visit your page will be amazed and impressed by your professional and clever approach to web design. Being as powerful as it is, Little Ones allows you to edit all its fun elements and make them follow your branding to the last detail. The template is based on Bootstrap, comes with an active contact form with validation and has four jolly color presets. Speaking of color, you can create your own version effortlessly. Little Ones also rewards you with MailChimp integration, Isotope filterable gallery, as well as boxed and wide styles. While some school website templates in this collection are more generic, the others are very niche oriented. Just like Martial Arts. It even has a name that goes straight to the point. Martial Arts is a template for karate, judo and just about any other martial art. Besides, you can also use it for boxing, fitness and other sports since Martial Arts is very adjustable and simple to use. In the package, you get a ton of ready-to-use homes that go from one- and multi-page styles. There are also samples for online store and magazine in case you have something different in mind. 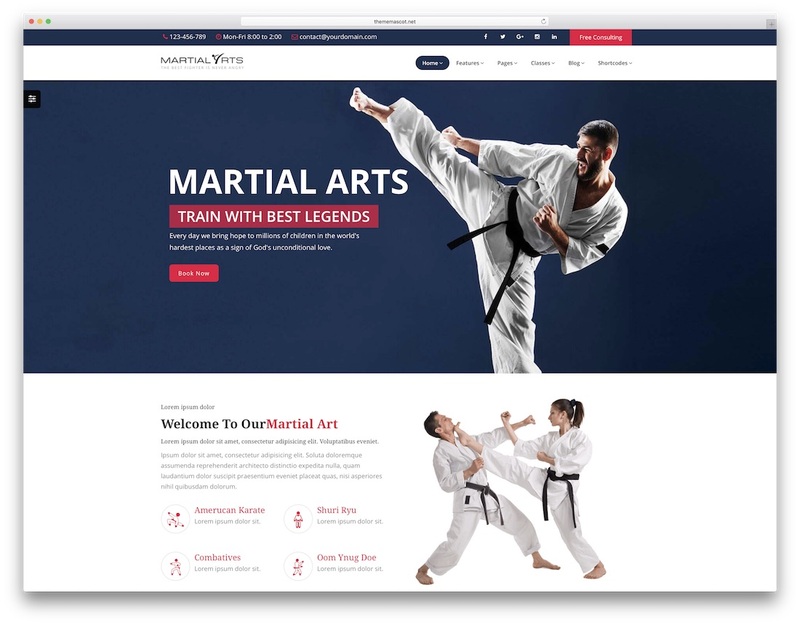 Or you would like to expand and create a large martial arts web portal. Revolution Slider and Menuzod responsive mega menu are two premium tools that you get at no extra cost. Utilize the available and have a page set and ready to go live quickly. 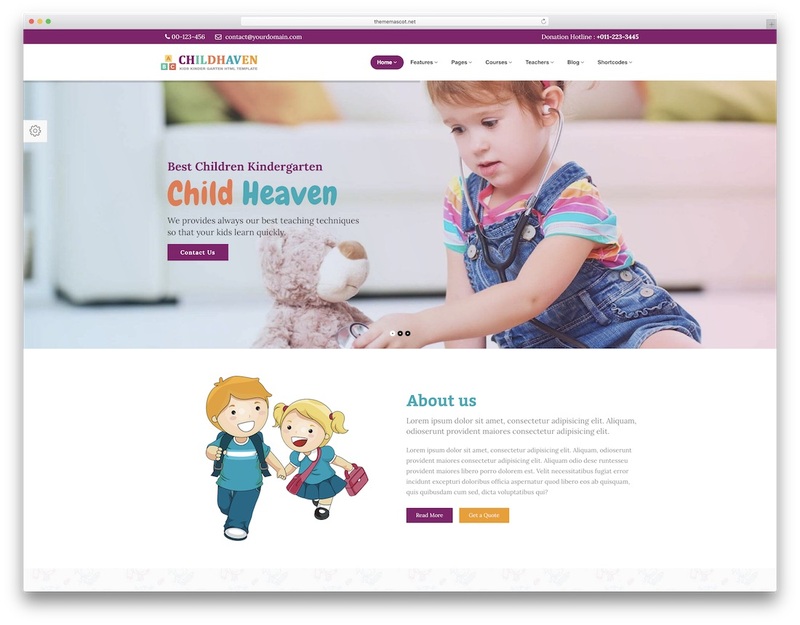 Children Haven is a high ranking template with tons of predesigned elements that you can use to make your first-class site. You can customize it and create a space that revolves around what your children’s school or kindergarten has to offer. The wonderful school website template, Children Haven, comes with over 140 HTML files with loads of demos that help you design your unique page. It is Bootstrap 3 that powers the template and makes it fully responsive and mobile-ready. All this calls is for an always smooth experience no matter the device they use. Active contact form, MailChimp, shop ready, comfortable mega menu, you name it, the tool has all and everything that you require. With several shortcodes, you can make changes to the look instantly and create a custom version to go against the norm. Proceed with Children Haven and quickly design the site you want. 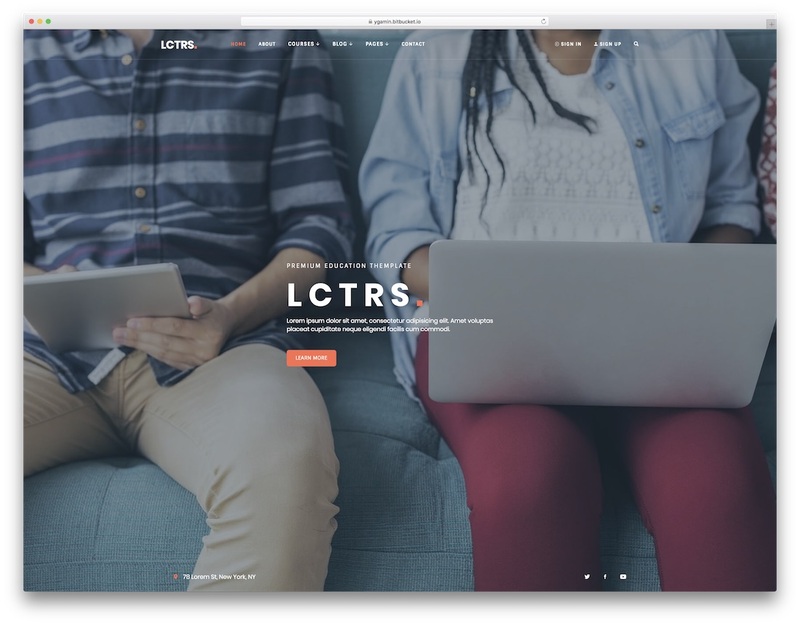 LCTRS is a modern and sophisticated school website template for loads of different types of education and online courses pages. With four homes and additional twelve inner pages, you have everything you demand at your disposal. The homes vary from static image and parallax banner to slider version and video background. As for the inner sections, LCTRS delivers blog, courses, teacher and event pages. Some of the key features of LCTRS are free updates, professional support, responsiveness and cross-browser compatibility. You already know that the web design is absolutely phenomenal so there is no need to mention it again. But to get the best understanding what is possible with LCTRS is for you to check out live preview. Prepare yourself to be blown away so make sure you sit tight. Educan is here to make your web design easy with a number of excellent ready-to-use elements that you can put to use right away. There is no need to wait for anyone to do it for you. With Educan, you can do it all by yourself and it will take you very little time and a small investment. Educan has a clean and neat look that is simple to navigate and will always look fresh. It is creative and modern, just like the people you want to bring to your school. Educan is mobile-ready and will give your users the same terrific experience every single time. And when it comes to first-timers, they will be impressed by the level of expertness you deliver with your page what will encourage them to take action. You will also gain access to a dedicated team ready to help you with any problems and answer all of your questions, every single day. 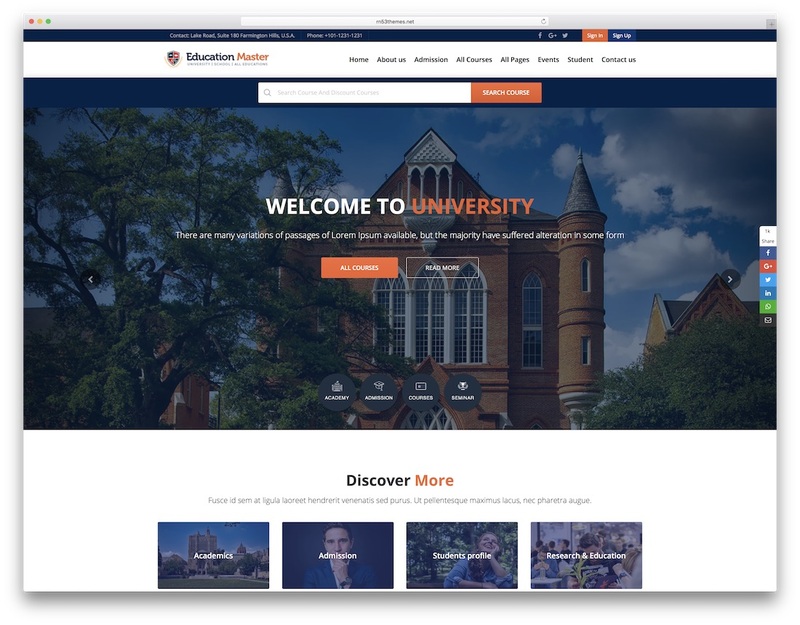 When it is time to update your college site, make sure you use Edumart school website template to get things going. The incredible tool comes with everything that you are going to need to make your web space vibrate. Wow and surprise all your existing students with something refreshing and glue new guests to their screens. Edumart has 22 pages to utilize and drive your traffic where you want it to go. Edit and improve each section with your creative and individual touches and make something unique and exclusive out of Edumart. 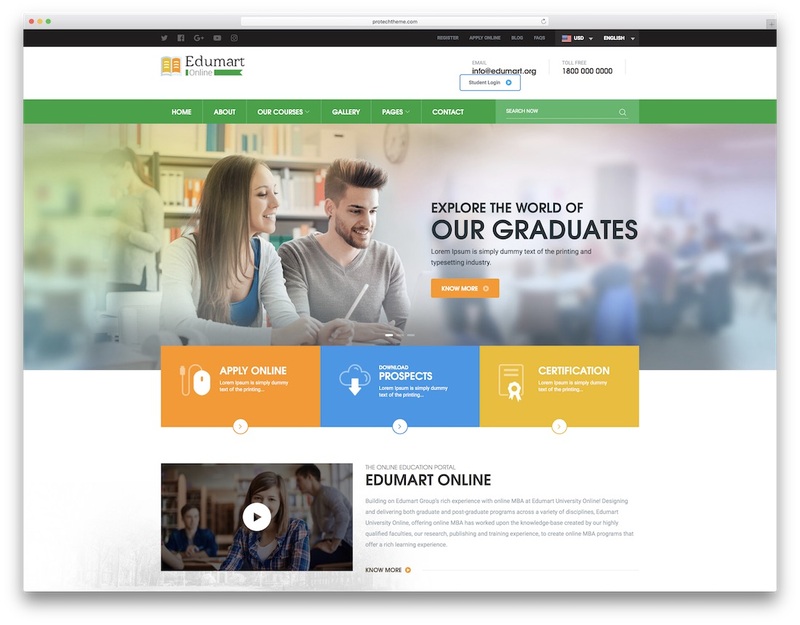 What’s more, the design of Edumart is contemporary, following all the latest web and tech trends. It is powered by Bootstrap 3 what makes the layout fluid, working on all devices according to plan. There should be nothing holding you back, Edumart has the goodies for your one-of-a-kind school page. 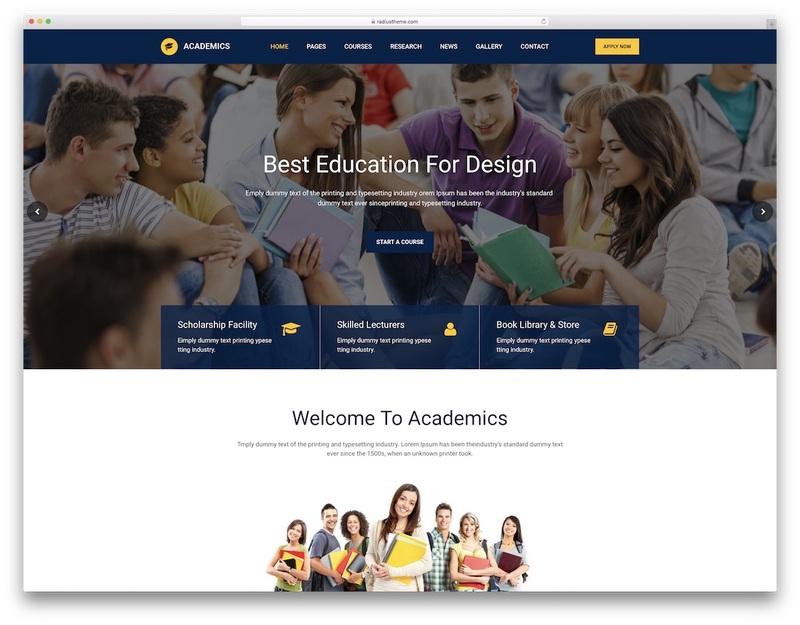 Academics is the best value for money school website template. With this template, you get plenty of pre-designed pages. 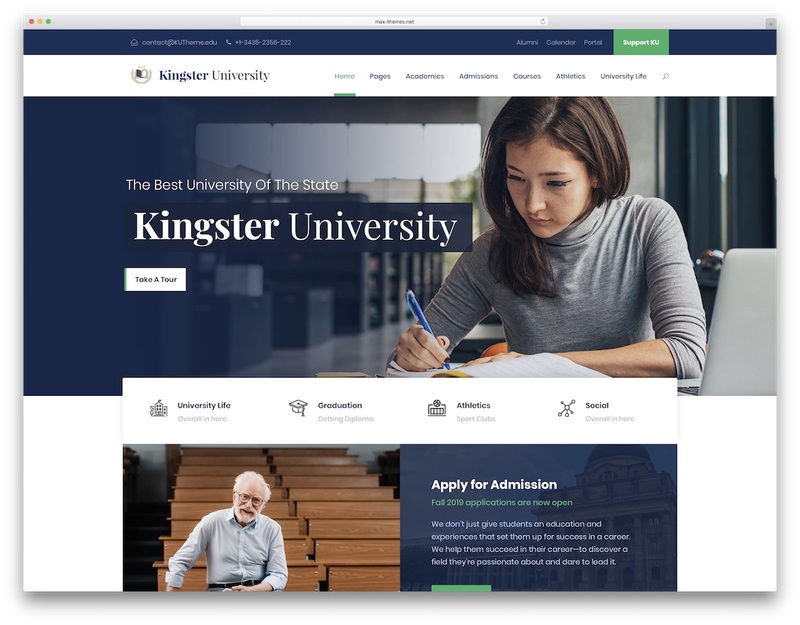 It is a multipurpose education website template, almost covered all types of course offering service-based businesses and also best suits for colleges and universities. This template provides you four types of homepage variations and thirty plus web pages pre-designed for you. All you have to do is to choose the template that best suits you, add your content and start your education website. By default, this template comes with shop pages, so if you need to sell courses on your site there are ready made shop pages for you. Academics is also a visually pleasing professional looking website template. 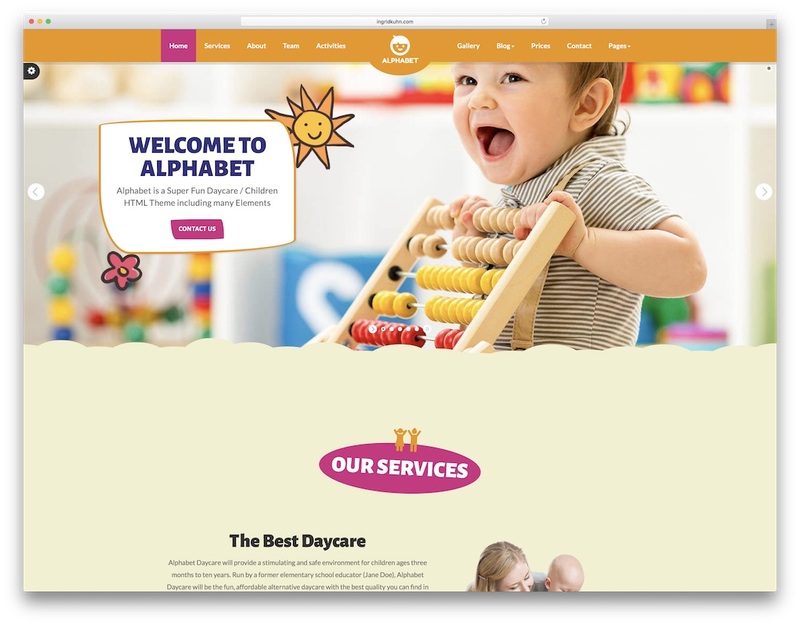 The alphabet is a daycare and kindergarten theme based HTML school website template. It is a clean looking website template which focuses mostly on the important things of the page. 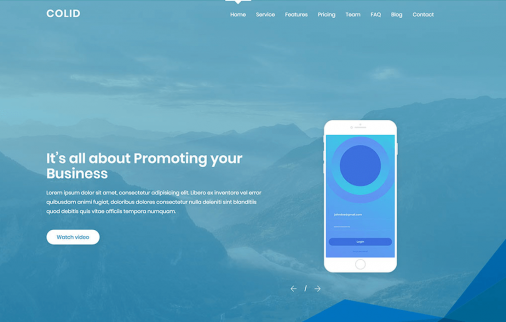 It is an interactive website template with cool animation effects. In the header section, you have big image slider with hand drawn like boxes and sketches. The boxes and the sketches move according to your mouse movements.You also get the option to add a call to action button in the header image slider. Alphabet also focuses on clear website branding. You have the center logo placement in this template so as soon as the users land on your site they know your brand. The animated sketched characters here and there in the template is an interesting design element in this template. These are the best school website templates you can use for your educational sites. Since all the templates mentioned here are premium templates you get customization support from the authors. So if you intended to make some tweaks to the templates make sure the option is available with the author and choose the theme. 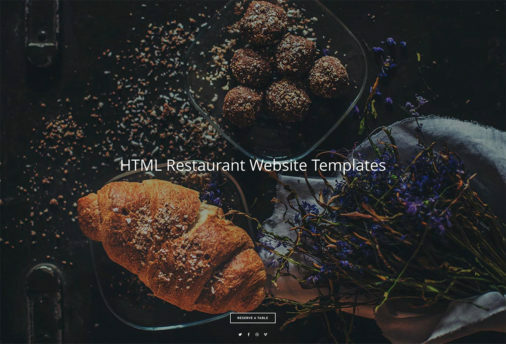 To get an even better idea before selecting a template for your site feel free to check out our other themes and templates collections. None of these are worth the time for me. I’m very lazy teacher and don’t want to setup them on my own. They look awesome but getting over my laziness is not easy.